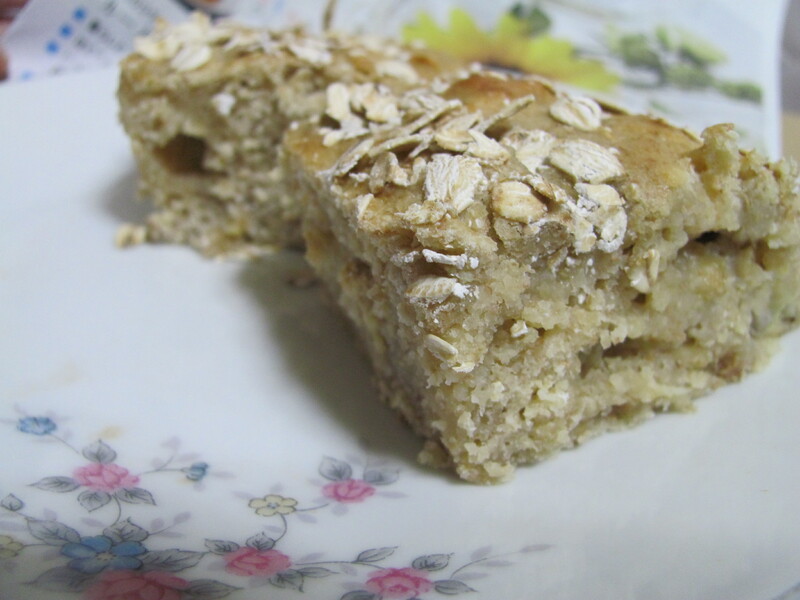 Tricks of the Trade: Oatmeal Banana Bread – I'll Make It Myself! Although this site is called I’ll Make it Myself!, a lot of the baking I do is less recreating restaurant meals I liked and more reinventing recipes to make them healthier and to make them work in a Japanese kitchen. Health-wise, my philosophy with baking is that almost any bread can be made over with whole grains and applesauce. For sesame-oil- or olive-oil breads, using the oil will favorably flavor the bread, so I don’t recommend changing it. However, if the recipe calls for vegetable oil or canola oil, you can swap those with unsweetened applesauce at a 1:1 ratio. That is, for 1 teaspoon of vegetable oil, use 1 teaspoon of applesauce. For the flour, swapping half the volume of all-purpose flour with an equal volume of whole-wheat flour generally works: for a recipe that calls for 1 US cup of all-purpose flour, you would use ½ cup all-purpose flour and ½ cup whole-wheat flour. The conversion isn’t as simple to remember if you measure in weight (grams) rather than in volume (cups), but 1 cup AP flour is 100 grams and 1 cup whole-wheat is 130 grams. Therefore, you would use 50 g of AP and 65 g of whole-wheat. (Please note that for this recipe, I added in oatmeal as well, so the ratio here is different.) This swap works best in muffins and loaf breads; for flat breads or flour tortillas, I have better luck with recipes that call for whole-wheat in the first place. Regarding the kitchen, to solve the problems I often have with bread not cooking through in the oven range as well or as quickly as it does in a full-sized American oven, I opted for a brownie pan to increase the surface area and reduce the depth of the bread. Finally, in banana breads, a combination of cinnamon and vanilla or lemon for a dimension of umami is common. I decided to use powdered ginger, lemon juice, and lemon zest along with vanilla. For a stronger lemon flavor, you could try lemon extract in place of the vanilla. 1. Preheat the oven/oven range to 190℃ (375°F). 2. Mix together the wet ingredients (B) and stir until incorporated. 3. In a separate bowl, mix together the dry ingredients (A). Make a well in the center and add the wet ingredients; stir. 4. Add C and stir to incorporate. 5. Pour into a greased 20×20 cm baking pan. Sprinkle oats on top. 6. Bake at 190℃ (375°F) for 30 minutes, or until the top is lightly browned and a test chopstick comes out mostly clean. Store covered at room temperature.